Londonskaya Hotel is ideally located in the heart of Odessa — Primorsky Boulevard — within a minute from the Opera and Ballet Theatrе, Literature and Archeological museums, many famous historical sites, shops and restaurants, Sea Terminal, 2 kilometers from the railway station and 12 kilometers away from Odessa International Airport. 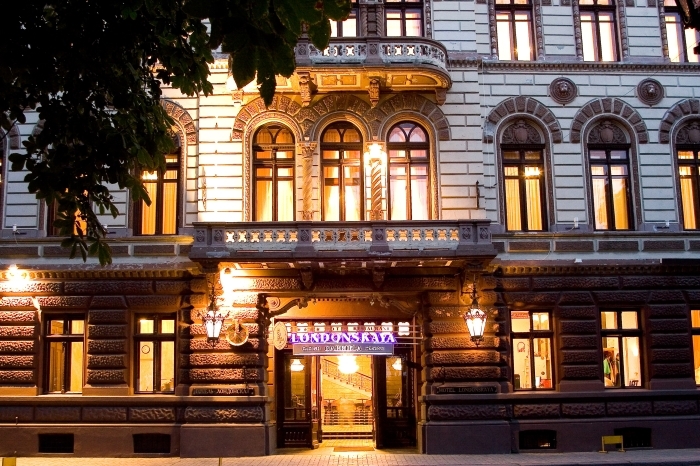 Nestled in the heart of the city, overlooking the Black Sea Londonskaya hotel continues to charm visitors with its combination of warm traditional style, superb service and legacy as a historical site. The hotel has hosted notable guests such as Anton Chekhov, Fedor Shalyapin, Robert Louis Stevenson, Marcello Mastroianni. A model of graceful elegance, unique and elegant Londoskaya Hotel combining old-world charm and architecture of Italian Renaissance style with sophisticated comforts and unsurpassed service was always an ideal destination for heads of states, writers, musicians, artists of past and present times. fitness & wellness Club, indoor pool, restaurant, bar, free Wi Fi, free public parking, room service, tour desk, ticket service, luggage storage, ATM/cash machine on site, concierge service, laundry, dry cleaning, meeting/banquet facilities. Comfortable ambience located at mansard level of the building. All rooms have an entrance hall, a bedroom (twin beds or one queen size bed) and a bathroom with bath and shower, hair dryer, terry robes, slippers and toiletries, and four towels set for each guest. Area – 18 sq m. Maximum number of people – 2. Cozy Superior Rooms which offer views on the beautiful Summer Garden or on the courtyard of the hotel in Odessa provide all standard amenities both for leisure and business travelers. Rooms have an entrance hall, a bedroom (twin, double, or king-size beds) and a bathroom with a bath and shower, hair dryer, terry robes, slippers and toiletries, and four towels set for each guest. Area – 21 sq m. Maximum number of people – 2. Comfortable rooms with renewed classical design in warm colors overlooking Summer Garden or inner yard of the hotel. Superior Executive room can have both Twin and Double bed configuration. Lavish Junior Suites overlooking Primorsky Boulevard have large foyer, one main room and a bathroom. All rooms have parquet floors, sitting area with arm-chairs, large windows and queen size beds.Classic style interior, light and airy ambience make them ideal for longer stays and working visits. Connecting rooms are available. Four towels set for each guest. Area – 30 sq m. Maximum number of people – 2. Bright and spacious one bedroom Suites or extraordinary two-level Suite 24 sq.m with the view to the Black Sea and the Primorsky Boulevard will make your stay unforgettable. All rooms are styled of the décor reflecting the elegance and dignity of turn-of-the-century. Connecting rooms available. Each of the suites comprises an entrance hall, luggage room, guest toilet, lounge, bedroom, bathroom. Area – 44 m2. Maximum number of people – 2. Stunning views of the Primorsky Boulevard and the Black Sea welcome you to a prestige two-level suite with the big balcony. The luxurious Presidential Suite has a separate lounge, bar counter, kitchenette, guest toilet and a large bathroom with bath and shower. Presidential Suite has accommodated figures of international stature, including heads of the states as well as many notable artists, business leaders, entertainers and other celebrities. Four towels set for each guest. Area – 48 sq m. Maximum number of people – 2.